Left click a postcard image to enlarge it. 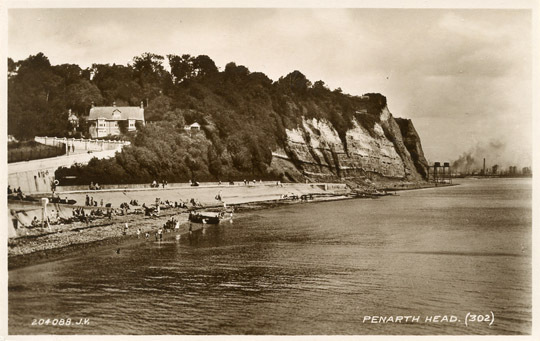 The Kymin is the building on the left hand side of the photograph, a few yards up Beach Road. The entrance to Cardiff docks is in the distance on the right hand side. The Penarth Council decided in 1947 that it would acquire the Kymin and a compulsory purchase order was approved by the Welsh Board of Health in November 1948. The purchase price was £4,500. The Council's intention was to open the Kymin as a public pleasure ground. From February 1952 the Council leased the ground floor of the house to the aviation firm Simmonds Aerocessories Ltd. Subsequently Simmonds Aerocessories took over the remainder of the house that had been let to private tenants. In the summer of 1952 permission was granted to Penarth Presbyterian Church to hold a summer fayre on the lawn of the Kymin. In subsequent years the grounds became a regular venue for events run by local churches and other organisations. The Parks Department occupied part of the garden for propagating purposes. The question of the future development of the Kymin was raised on a number of occasions. In 1959 the Council considered a proposal to build a new public swimming bath there, but decided against any development "for the time being". There were also a number of offers, which were declined, from property developers with proposals to build flats on the site, or to develop it as a hotel, lido and boating lake. In 1964 it was agreed that the Clerk of the Council, who already had a tenancy for part of the house, could take full possession of the house and carry out conversions to the property at his own expense. In the late 1960s the Council obtained planning permission to develop a recreation centre at the Kymin, including new swimming baths, and this necessitated discussions with the Earl of Plymouth to obtain release from a restrictive covenant on the site. This was one of a number of plans for the Kymin, none of which came to fruition.